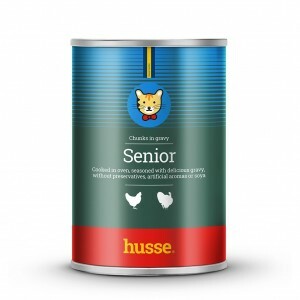 Complete feed for senior cats. Cooked in oven, seasoned with delicious gravy, without preservatives, artificial aromas or soya. High quality proteins, good vitamin integration and good digestibility make Senior chunks in gravy with chicken and turkey a healthy meal for your cat. 45% meat and animal derivatives, cereals, eggs and egg derivatives, minerals.